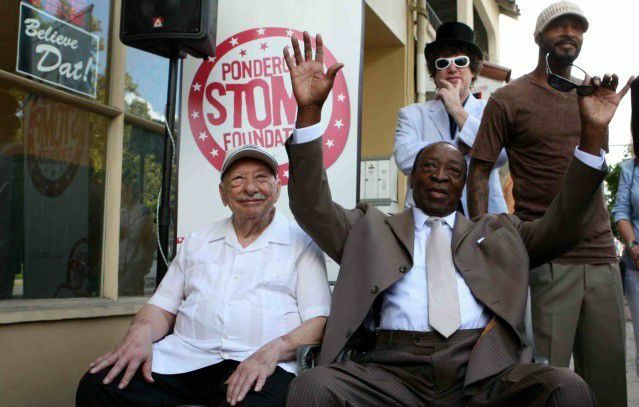 This week marks the 100th birthday of Dave Bartholomew, a music legend who helped introduce the rock 'n' roll sound of New Orleans to the world. Among his many credits, Bartholomew was the producer, songwriter and arranger behind Antoine "Fats" Domino's biggest musical hits in the 1950s and '60s, as well as a top trumpeter and bandleader in his own right. Bartholomew was born on Christmas Eve, 1918 in the St. John the Baptist Parish community of Edgard. He already had made a name for himself as a bandleader and performer when, while working as a talent scout for Imperial Records, he discovered Domino playing piano in a neighborhood bar. Their 1949 version of "The Fat Man" set them on a path to stardom. Bartholomew either wrote or shared a songwriting credit with Domino on many other hits including "Ain't That a Shame," "Blue Monday," "I'm Walkin'," and "Walking to New Orleans" (co-written with Bobby Charles). In addition to Domino, Bartholomew worked with and produced for dozens of other music greats. He wrote "I Hear You Knockin'" for Smiley Lewis and "Lawdy Miss Clawdy" for Lloyd Price, just to name two. Bartholomew was inducted into the Rock and Roll Hall of Fame in 1991, the Songwriters Hall of Fame in 1998 and earned a special Grammy Trustees Award in 2012. In presenting that award, Dr. John said "Guys like Dave Bartholomew come along once in a lifetime. … You touched people all around this world with music, the magic of yo horn, yo productions, and yo genius for putting things together." Very impressive...there is so much of the roots of the music I love that I still do not know. Doesn't look a day over 99 1/2.